Crew members from Task Group 56.1 launch a MK 18 MOD 2 Kingfish unmanned underwater vehicle from a rigid-hull inflatable boat during Squadex 2016, on Aug. 2, 2016, in the Persian Gulf. Squadex 2016 demonstrates U.S./U.K. mine detection capabilities in the U.S. 5th Fleet area of operations. US Navy photo. The Navy submarine community is pushing hard to make progress on unmanned underwater vehicle development and operations, which lag behind unmanned aerial vehicles, through prototype testing and the creation of a UUV squadron. Rear Adm. William Merz, who recently took over as the service’s director of undersea warfare (OPNAV N97) said Oct. 27 at the Naval Submarine League’s annual symposium that the submarine community currently gets more use out of unmanned aerial vehicles, which are more technologically mature and easier to operate, and he wants to see UUVs catch up. “I’m tired of waiting,” he said. 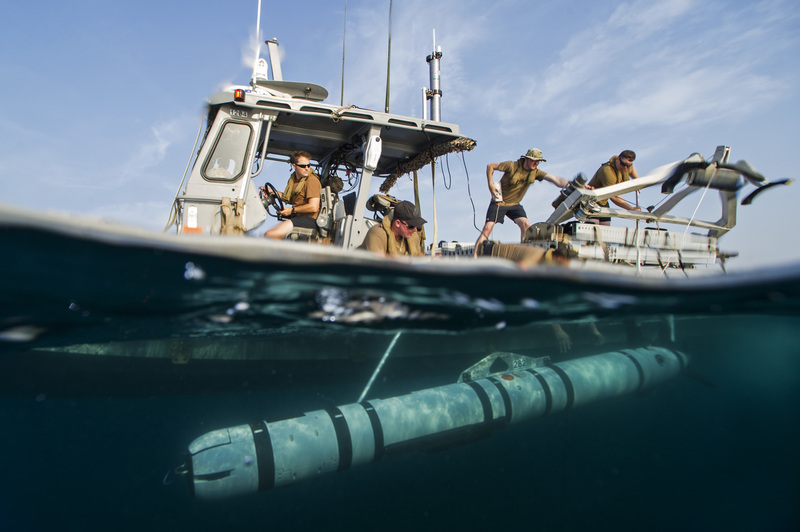 He noted the Mk 18 Mod 2 Kingfish UUV was brought to the Middle East in 2012 and used by a team of developers and U.S. 5th Fleet sailors to conduct real missions. “We think we pretty much skipped a whole generation of testing, evaluation and development” thanks to the rapid fielding approach, Merz said. The Navy expects to buy its first SSN(X) in 2034, which means an analysis of alternatives to select a material solution to meet the warfighting requirement would happen in the early- to mid-2020s, he said. Ahead of that AoA, the Navy needs to learn everything it can about UUVs, multi-domain unmanned vehicles such as those that can be launched from undersea and then fly through the air, and unmanned vehicle support systems like the Forward-Deployed Energy-Charging Outpost (FDECO) that UUVs could connect to and recharge mid-mission. While Merz is encouraging industry to send him solutions that could be fielded and tested today, Jabaley said he was soliciting any idea, no matter how crazy, for future submarine-based unmanned systems. “We have for years used any available interface on the submarine to get the UUV off the ship, whether it was torpedo tubes, 3-inch launcher, trash disposal unit – we have to get beyond that, there has to be a better way to design this submarine from the ground up to seamlessly employ UUVs,” Jabaley said.